Delicious Apple Ring Fritters start with juicy apples and a buttermilk batter before frying to a golden brown! Then coat them in sugar and serve with your favorite caramel or chocolate dippers! Fall came to Chicago and then disappeared again, with temps in the mid 80’s this weekend. I love those unexpected warm days in the middle of September! When people think of Fall, they usually visualize pumpkins, apples, sweaters and boots, and coffee (okay fine, coffee makes my list no matter what season)! Today, I’ve got a delicious apple recipe that your family will LOVE. But first, I think you need to know about this easy, Apple Ring Fritters shortcut. I regularly share recipes for Crunch Pak apples around here…you know, the sweet, sliced apples that everyone loves. Guess what? They now sell APPLE RINGS. I’m so excited you guys. Here’s why. I’m lazy. 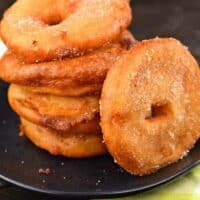 As much as I love seeing all these awesome recipes on pinterest using Apple Rings, I know I’ll never take the time to core and slice an apple into rings. I just know myself. No more holding back now though, because I’ll be stocking up on these Crunch Pak Apple Rings for Fall. And the first recipe I’m sharing is this crazy easy APPLE RING FRITTERS idea. One thing I’m here to tell you. You don’t need a deep fryer. Okay? If you have one, great. If you don’t, grab a stainless steel (or cast iron) skillet, or small saucepan. Add about an inch of canola oil (or vegetable oil) and heat it up. While it’s warming up, I whip up the batter to dip the apple rings into. Oh, and no need to prep those apples, I simple just open the bag of Crunch Pak Apple Rings, haha!! I don’t even peel them for this recipe! Once your oil is hot (about 375°F), dredge your apple ring in the batter and put it in the hot oil. Cook it until it browns on one side, then flip to the other side and allow it to become golden brown! While these are simply delicious as is…you can go a step further and make a few fun (SWEET) toppings. The first, is sprinkle them with cinnamon sugar as soon as you remove them from the oil. I actually do this to ALL of them. That way I know they are sweetened like a fritter SHOULD be! The second option would be to cool for a few minutes, then coat them in powdered sugar (I do this AFTER adding the cinnamon/sugar blend). Go one step further and serve with some caramel or chocolate to dip them in! However you serve them, I’m sure these will be a hit. 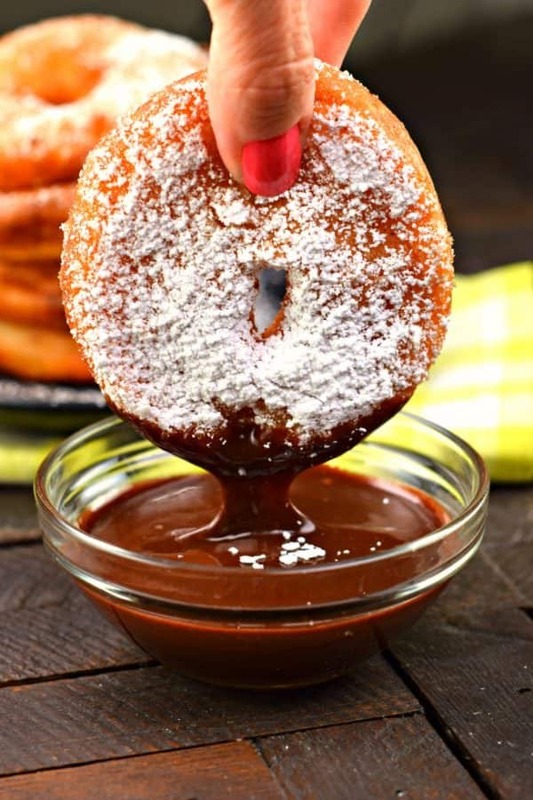 They are immensely satisfying hot out of the pan….but they have a whole ‘nother level of deliciousness if you let them cool and coat them in powdered sugar. Seriously, you decide. It’s a win no matter what! 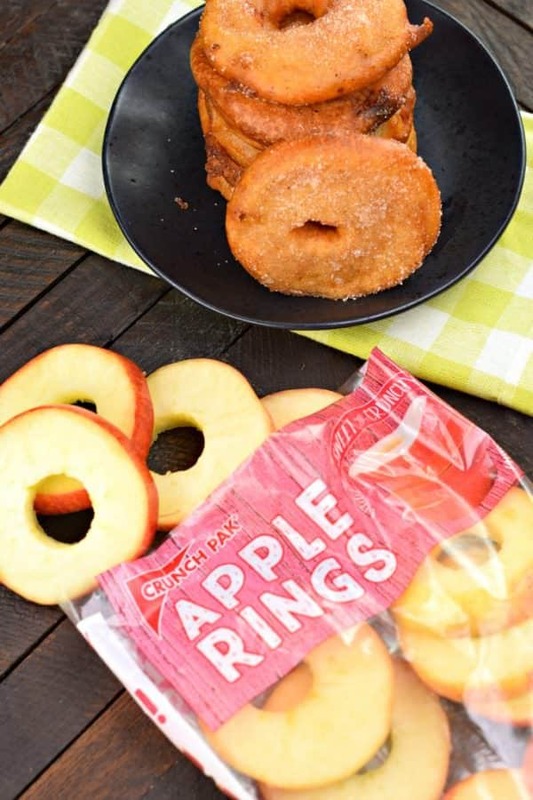 Want more APPLE RING recipes? Stay tuned! 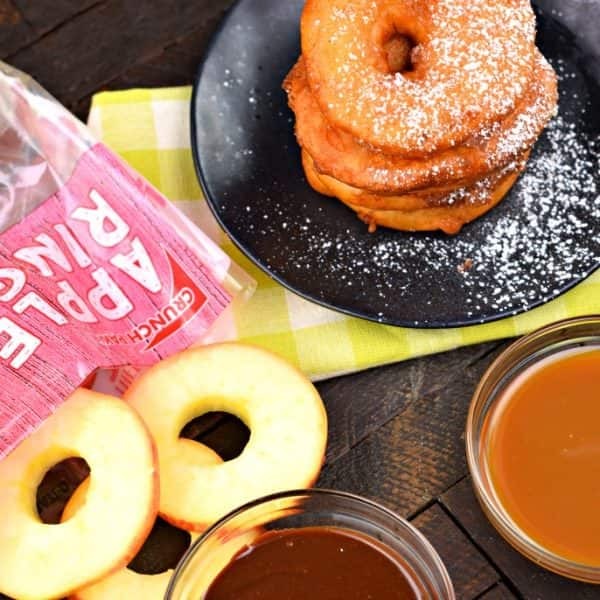 Jocelyn from Inside BruCrew Life and myself will be hosting APPLE WEEK in October, and we each have a few exciting APPLE RING recipes up our sleeves! If you follow me in Instagram, you may see a sneak peek in my stories! 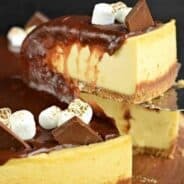 Be sure to stop on over to Crunch Pak for some delicious recipes and ideas! In a medium sized stainless steel skillet, or cast iron skillet, add canola oil. Heat over medium heat until temperature reaches about 375°F. While oil is heating, combine milk and egg in a small bowl. Whisk in the flour, sugar, cinnamon, nutmeg, baking powder, and salt until smooth. 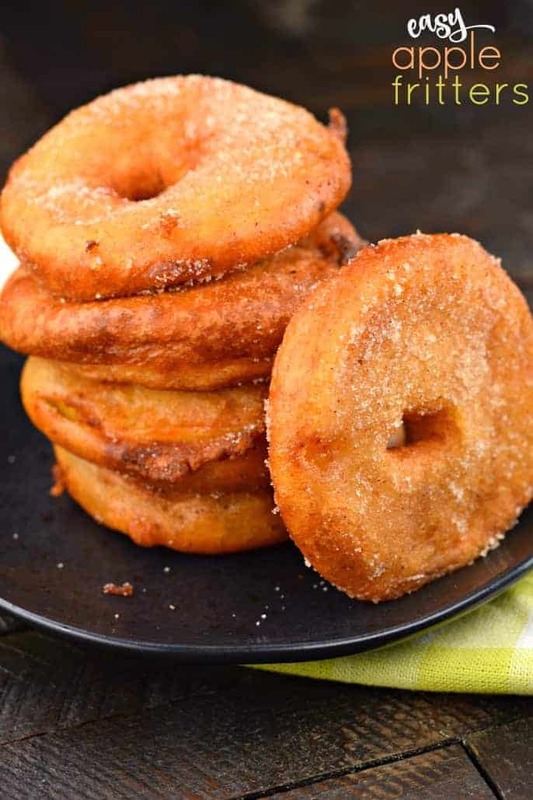 Once oil is hot, dredge each apple ring in the batter until completely coated, and place gently in the batter. Fry a few at a time until golden brown, flipping to make sure both sides get cooked evenly. Using tongs to remove from oil, place on a paper towel lined plate while doing the remaining apple rings. Sprinkle with cinnamon sugar mix immediately! Once done, add powdered sugar (if desired) and serve with caramel and chocolate sauces (if desired). ENJOY! This is such a great idea! I love that they sell rings now! That caramel sauce….yes! 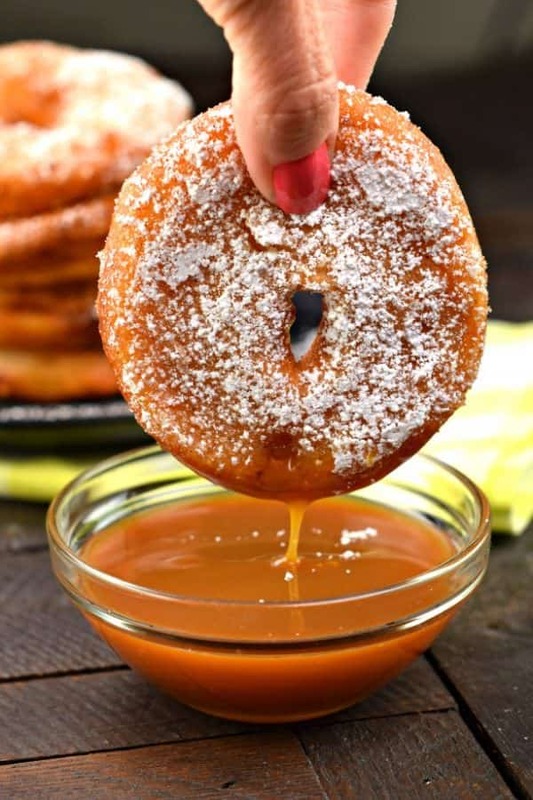 So easy to whip up…and the caramel with the fritters was SO tasty. Pre-cut apple slices sold at the store? Yes, please! Sold! lol. Oh my, these could be addictive I am sure. Oh yum, these look delicious!! And I LOVE that you can just buy apple rings instead of slicing your own! Right? Makes it even easier! We don’t get apple rings here in India. So how to cut the apples in rings. My grandson loves apples so I wish to try this recipe for myself. My favorite kind of fritter. 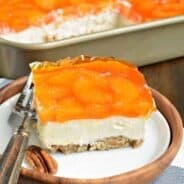 Best fall dessert ever! This looks so insanely delicious. What an awesome apple treat! What a fun idea and you don’t have to deal with the core! What a clever way to do an apple fritter! I’m so ready for apple season now! YUM! 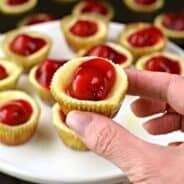 I HAVE to make these sometime this fall!! I love these sweet, sliced apples!